With the establishment of its new Urban Air Mobility unit, Airbus aims to lay the foundations for more efficient and sustainable city travel. To co-create an entire industry from scratch, it will develop cutting-edge technical solutions as well as engage a wide range of stakeholders to ensure maximum societal benefit. Voom is currently operating in São Paulo and Mexico City, and the demand is already impressive. The service will be launched in other megacities in 2019 and beyond and will continue to lay the groundwork for Airbus’ longer-term vision of urban mobility using electric vertical take-off and landing (eVTOL) vehicles. “Voom has proven to be an awesome mechanism for us to glean key insights into the potential of the on-demand air mobility market and passenger preferences, and we are constantly relaying those insights to the UAM team,” says Monnet. Realising that future vision is the task of Airbus’ new UAM unit, established in June 2018. Voom is just one part of the unit, which hosts the ongoing UAM activities across the company, from air traffic management to infrastructure development, including partnership building and pilot projects. It also steers the development of Airbus’ ongoing eVTOL demonstrators, Vahana and CityAirbus. A key responsibility for the new unit is understanding how UAM can introduce an added mobility solution to a city’s existing network for the benefit of its citizens. By gathering urban flow data from cities like Paris or Beijing and using advanced modelling software, Vincent Loubière - Airbus’ Director of City Integration and Infrastructure Development for UAM- and his team of designers, urbanists, architects and sociologists can simulate and understand how people move around to develop sustainable urban development strategies. “Not only have cities become more densely populated in recent decades, they have also become increasingly centralised as more people travel to, from and around a central point,” says Loubière. This is putting a tremendous strain on ground transportation. Cities have been trying to fine-tune these systems to alleviate the issues, but without major changes, the scope is limited." 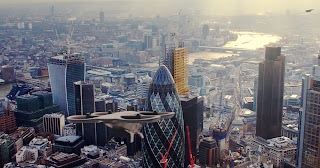 Urban air mobility could bring an entirely new dimension to the way we live and, in the process, reshape city planning. By experimenting with virtual models, Loubière and his colleagues are beginning to design convenient, sustainable systems that could seamlessly integrate into an existing city infrastructure. Of course, some new elements will be required, which is why the team is looking at different types of ‘vertiports’ – an airport for VTOL vehicles. This could range from a single landing pad on top of a building to a larger system of multiple landing pads that could redefine the purpose and function of motorways. Beyond working out infrastructure requirements, the unit, through Isabel Del Pozo, Head of Airspace Management, is also exploring solutions that will ensure this new era of flight operates safely and efficiently in the urban airspace. Del Pozo wants to create more intelligent, autonomous and decentralised traffic management solutions that support operations in urban areas, from helicopters to drones. This will gradually pave the way for autonomous eVTOLs carrying passengers. A key element is unmanned traffic management (UTM). For almost two years, Airbus has been gathering requirements from key stakeholders to define a clear picture of the future traffic management solution and associated services. “This vision will guide our work for years to come,” says del Pozo. Airbus isn’t the only company looking to tap into the potential of urban air mobility. Joerg Mueller says there are now more than 100 different electric VTOL vehicles under development by ambitious start-ups and established global names. To create an entirely new industry, dialogues and alliances across sectors are crucial, as is the active engagement of communities. In 2017, Airbus was appointed to lead the European Commission’s UAM Initiative, which is part of the wider European Innovation Partnership on Smart Cities and Communities (EIP-SCC). Managing the initiative is Vassilis Agouridas, Senior Manager Strategic Innovation at Airbus. "Our aim is to mobilise cities and regions across Europe along with a wide ecosystem of stakeholders interested in launching practical mobility demonstration projects with ground and air mobility"